You will be given a reference e-book to read which has 613 pages And the test will be based on that e-book , you can take final test within 1 year of purchase. Personal financial planning refers to the process of preparing financial plans for people. These plans usually cover a variety of aspects related to personal finance including cash flow management, investment planning, retirement planning, tax planning, insurance planning, education planning, business succession planning and estate planning. Among the major objectives played by this process is to offer risk and inflation adjusted returns for various clients. The person who is certified to perform this process is called a certified personal financial planner who can be expected to perform his functions by creating an effective financial plan and developing more detailed strategies that are specifically tailored to meet the specific situations and goals of clients. He performs essential functions such as considering all your financial questions, advices and information and how these can have a major impact on your current life and financial situation. It should be noted that personal financial planning is a process which offers comprehensive functions. These include offering financial security to clients, ensuring that all their personal finance and financial goals are met, figuring out the meaning and direction of a person’s financial decisions, easily adapting to major changes in life and use these changes to become even more financially secure and effectively comprehending how different financial decisions can impact other financial areas. The process also ensures that you will obtain all your financial goals based on the specific date that you have targeted and develop a more effective and sensible plan that will allow you to effectively deal with all your financial challenges. 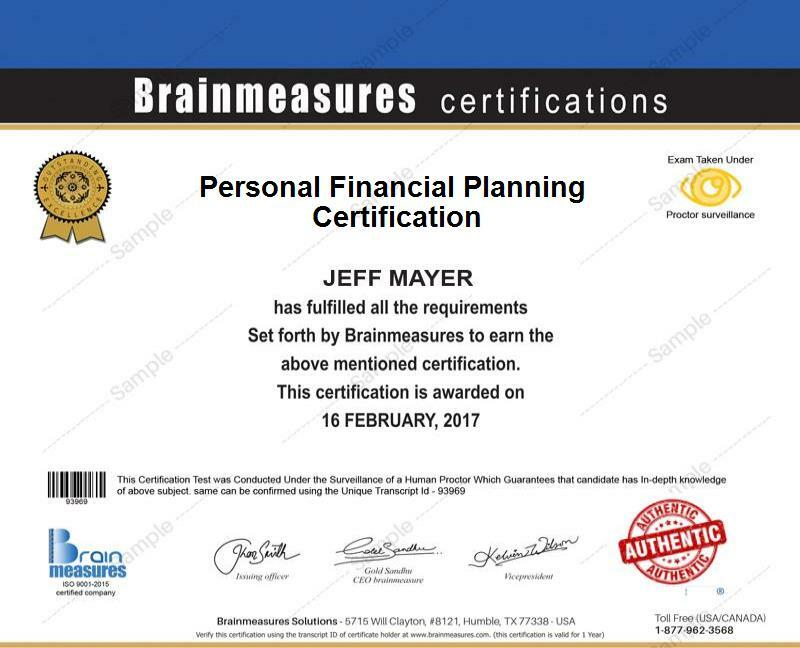 Gathering all the information that you need to become a personal financial planning expert is now possible with the presence of the personal financial planning certification course which is now available at Brainmeasures. This personal financial planning course caters to the needs of all those who dream of acquiring greater knowledge about this specific field considering its high level of comprehensiveness and accuracy. By deciding to take part in this online certification program, you will find it easier to undergo a kind of personal financial planning training which works in providing you with comprehensive and accurate details about how the whole process works, its scope, its major objectives and functions, the steps and procedures involved in developing the most effective personal financial plan and how you can take advantage of this process in obtaining a more secure financial condition. By earning your personal financial planning certificate, you will find it easier to offer the best service to clients who may seek out your knowledge, skills and expertise in the field for a fee. How to effectively use insurance? You will never regret enrolling in the personal financial planning certification program offered by Brainmeasures considering its effectiveness in your attempt to gain a more complete understanding about the whole process. You can expect this certification course to work for all those who plan to obtain a more stable career in the personal financial planning industry including financial planners, bankers, accountants, lawyers and financial professionals. You will find the act of receiving your personal financial planning certification even more amazing after you realize how effective it is in raising the level of your salary. After you receive your personal financial planning certification, you will get the chance to work as a personal financial planner which allows you to receive around $50,000 to $117,000 annually. It is also possible for you to get the position of a personal financial planning consultant which allows you to get an annual salary of as much as $186,000 per year.